As 2017 is quickly coming to an end, a recent report by Innova Market Insights takes a look ahead at 2018 and the trends that will be impacting the food and beverage industry. 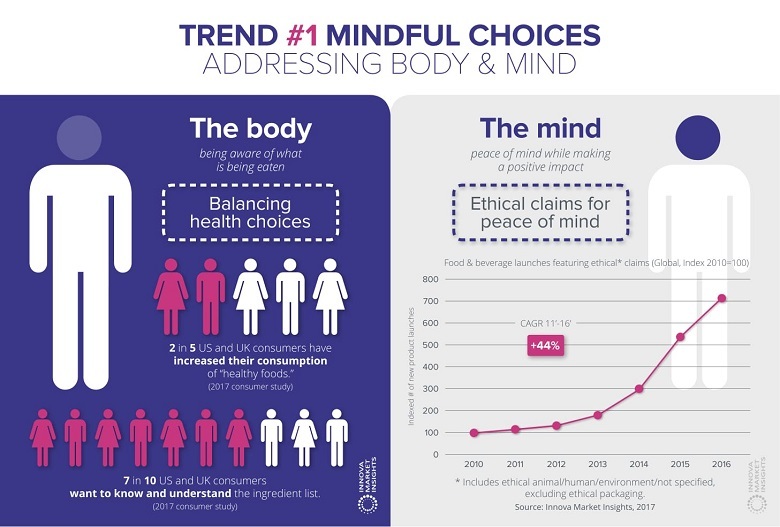 Some of the report's key findings found that 4 in 10 U.S and UK consumers reported an increase in consumption of healthy foods and 7 in 10 wanted to understand the ingredients used in their products. This has resulted in better-for-you claims increasing from 42% in 2012 to 49% in 2017 YTD. Mindful choices. Consumers increasingly want to know what is in their food and how it is produced. They also are more conscious of ethical issues and claims. A lighter enjoyment. Consumers are continuing to look for ways to eat and drink that benefit their health. They are looking for products that have light alcohol content, sweetness, flavor and even texture. Processed positivity. In addition to being aware what is in their products, consumers are increasingly concerned about the processes used in creating their products. Fermented foods and cold brew tea and coffee are among the products to grow in this area. Full circle. Similar to being concerned about the process, consumers are looking for products and companies that are resource-smart and pursue food waste innovations. Outside the coffeehouse. Coffee flavors are finding new growth outside the traditional coffeehouses. This includes coffee flavored energy bars, jams, butters and yogurts, among others. In addition to these, Innova Market Insight sees trends forming around product color, dining-in-and-out options, snacks, ocean gardens and vegetables.